The Rangers Pro line of tripods are constructed of a high-density carbon fiber, making them extremely portable and versatile. Each leg is infinitely adjustable, allowing for perfectly stable pictures, no matter the terrain. The special design of the top ball-head adaptor is able to swivel 360 degrees and also has two built in levels to ensure you get the exact picture you want at the exact angle you want. 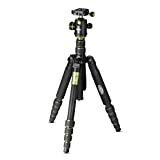 This tripod also features a removable leg that can double as a monopod when attached to the included ball-adaptor. The Rangers Pro Q666-C with its extremely versatile design and high-density carbon fiber make it the ideal tripod from amateurs to professionals. This entry was posted in Discount Photography and tagged Ball, Canon, Carbon, DSLR, Fiber, Fuji, Head, Leica, Lumix, Monopod, Nikon, Olympus, Pentax, Professional, Q666C, Rangers, Sony, Tripod by Ball Photo. Bookmark the permalink.